Peter Thevenot and River Road Farms' espaliered trees have been extensively featured in news articles throughout his 20 year career. His espalier trees have been used in landscape design and botanical gardens across the country. Read articles from The New York Times, The Chicago Tribune, and others to learn about his passion for the espalier art form in landscape architecture. Happy Holidays from River Road Farms! We want to wish you and your families a safe and happy holiday season. Thank you for your interest in the art of espalier and for making this one of the best years in our history. We look forward to working with you to enhance your landscape design and to provide you with world class service. Enjoy the holidays and don't hesitate to contact us if you have any questions. What if you could pull fresh, delicious fruit from an ornamental tree in your small garden without taking a big footprint in your landscape design? Some of our favorite trees are the fruit trees, which we have trained into a variety of shapes that produce home-grown fruit each season. 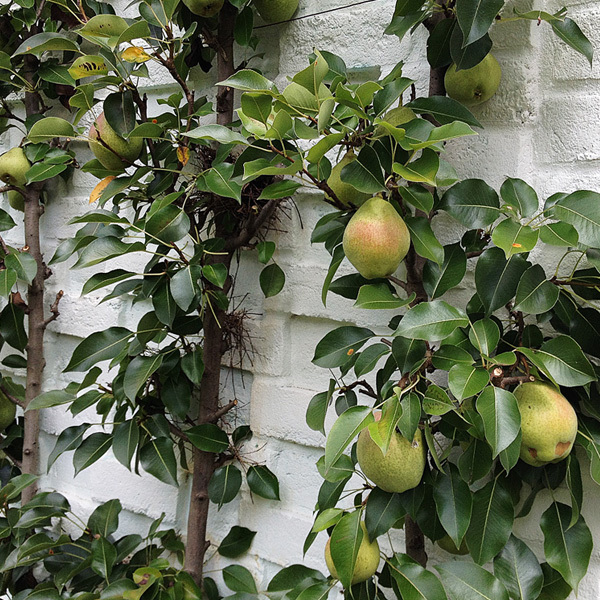 Since espaliered trees grow against a wall, they make efficient use of space while adding beauty and delicious fresh fruit at your fingertips. The art of training fruit trees into ornamental designs started in 16th century Europe, and our trees remain true to the original techniques. 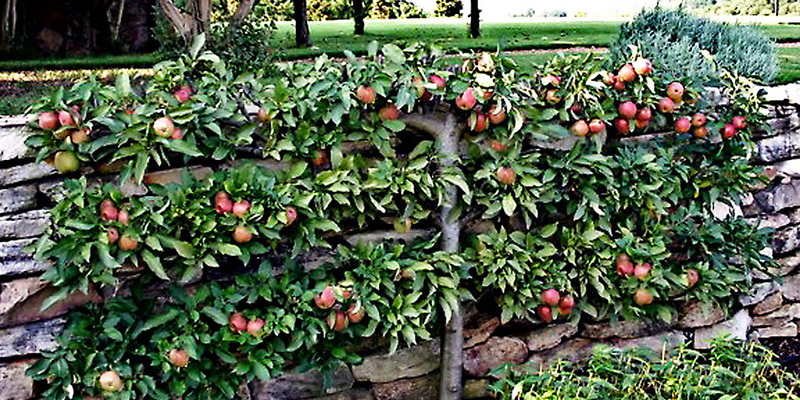 Many kinds of fruit trees may be trained to be horizontal cordons, fans, candelabras, Belgian fences, and arbors. Small footprint, big impact. Espaliered trees require minimal space, which makes them perfect to dress up a small space, rooftop garden, or wall. Fruit to boot. A home orchard produces fresh, sustainable fruit, year after year. Plus, there is no doubt where it came from...your own garden. In addition to a unique design and delicious fruit, one of the great benefits of adding a fruiting tree to your landscape design is its annual growth cycle. These trees really bond with owners as they blossom, develop fruit, and become dormant for winter. We deliver the finest specimen espaliered trees available to most parts of the United States. Please call or email If you have any questions about an espaliered fruit tree for your project and we'll help find the right solution for you! Of all the espaliers that we train, the Belgian Fence is the most striking. The Belgian Fence is created by a series of uniquely shaped espaliers which are planted two feet apart so that their branches cross creating a diamond-like pattern. These espaliers make impressive backdrops and space separators which have a high "wow" factor. We have many of these trees ready for planing, so don't hesitate to contact us if you have any questions. We love the Belgian Fence. 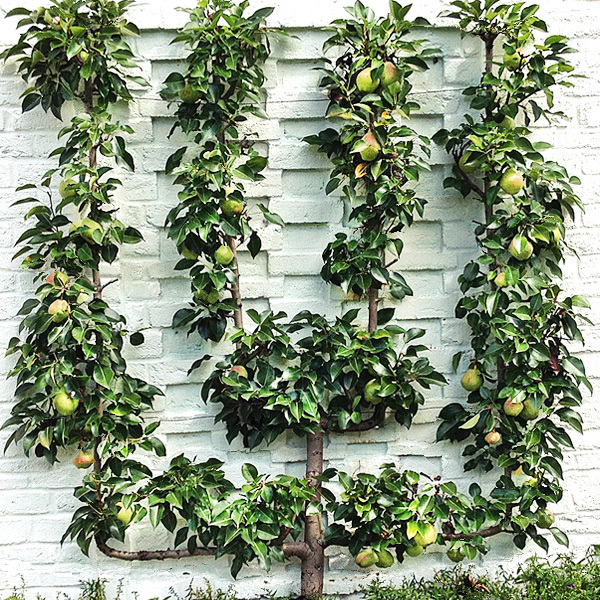 They are very versatile espalier designs because they can be free standing or set against a wall...let your imagination be your guide. They are incredibly functional. Consider using a Belgian Fence to create outdoor rooms. Their design will impress year-round and provide a wall-like privacy when in bloom. During the holidays, they are prime candidates for Christmas lights (view our gallery to see an example). Consider how the interior of a space is framed with the exterior. A Belgian Fence can make a big impact on an interior space and make it feel like the living space is extended to the outside. Add a Belgian Fence in front of an evergreen screen. The repetitive structure of a Belgian Fence is perfect for lining a driveway, walkway, or adding an impressive design element against a long wall. Imagine walking thru an allée in the garden with the diamond pattern on both sides of you, ablaze with beautiful white flowers in the Spring, golden or red fruit hanging from the branches in the Summer and brightly colored leaves in the fall. Winter interest is equally impressive with their neatly defined pattern in bark and fruit spurs, guiding your eyes as you take a winter walk. Please call or email If you have any questions about a Belgian Fence for your project and we'll help find the right solution for you! Several years ago I took a trip to Mount Vernon to tape for my shows and well, just because I love the gardens there. George Washington's passion for gardening has always been an inspiration for me and many of the designs used at the Garden Home Retreat spring from his ideas. You will see as the Garden Home Retreat develops that I have planned the Garden Home Retreat to be a ferme ornée, or ornamental farm, similar to Mount Vernon. I have always coveted the espaliered apple and pear trees at Mount Vernon so I made sure to incorporate some into the landscape plan of the Garden Home Retreat.